William Rogers McIntyre was born in Lachine, Quebec, on March 15, 1918. He is the son of Charles Sidney McIntyre and Pauline May Sifton. When he was young, his family moved to Moose Jaw, Saskatchewan. He studied at King George Public School and the Central Collegiate Institute in Moose Jaw before attending the University of Saskatchewan, from which he graduated with a B.A. in 1939. He enlisted in the armed forces two years later and served overseas in the Second World War. In 1946 he returned to Canada and completed an LL.B. at the University of Saskatchewan. Called to the bars of Saskatchewan and British Columbia the following year, he settled in Victoria and joined the law firm of Whittaker & McIllree. He was appointed to the Supreme Court of British Columbia in 1967 and elevated to the British Columbia Court of Appeal six years later. 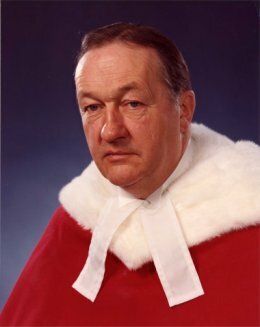 On January 1, 1979, he was appointed to the Supreme Court of Canada. He served on the Supreme Court for 10 years and retired on February 15, 1989. Justice McIntyre died on June 14, 2009, at the age of 91.